NEW SALES DISCONTINUED: Support & Maintenance continues to be available. Contact your Sales Rep for specific details. With unmatched flexibility and reliability, the Alert II Emergency Conference System instantly connects key first responders and enhances command and control capabilities through improved communications and response. 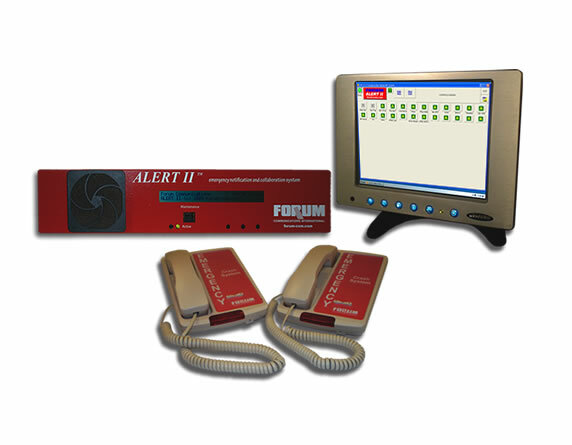 The Alert II system is a form-fit replacement for outdated crash (red phone) systems. Designed for, and in collaboration with, the US Military and exceeding both Military (AFI 13-203 / 13-213) and Commercial Aviation FAA Advisory Circular 150/5210-7D requirements for Airfield operations, the system incorporates state of the art technology for instantaneous ringing, clear conference communications, and a Touch Screen graphical user interface (GUI). 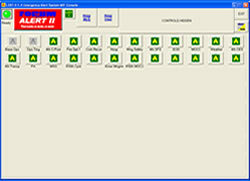 Alert II is the next generation product for the Alert Plus model. The Alert II Emergency Conference System is an emergency crash notification and conference system (PCAS or SCN) designed specifically for Military and Commercial Airfield applications. The system is completely independent from other systems or networks, is extremely reliable, easy to configure and maintain, and provides consistent performance. One solution that establishes a clear, secure and immediate teleconference, initiates alarms, warning lights, broadcasts conference audio via public address systems and opens Fire / Security bay doors. Each Alert II system can provide the exact configuration needed to support your varied Command & Control situational requirements. The system meets limited space requirements, is easy to use, has touch screen control, visual indication of system status and operation, superior sound quality and proven reliability. The Alert II system is successfully deployed in many US Air Force, Air National Guard, Army Airfield, and Naval Air Stations, and Commercial Airports across the US and around the World.